This game is Rival Gaming’s version of the casino stalwart baccarat. All the normal rules apply. Your first step to play this game is to select your chip size from the array of chips at the bottom of the screen. You can combine chips to make any size bet you want up to the maximum permitted. You make your bet by clicking on one of the three betting circles – banker, player or tie. You can bet on more than one if you want, and all three if you choose to, although that’s a loser in the long run, due to the five percent commission paid whenever the banker wins. The object of the game is of course to bet on the winning hand (or for it to be a tie if you have bet on a tie). The dealer plays both hands. The winner is the hand with a total that is closest to nine. If the total of the hand is more than nine, then only the right-hand digit is considered to contribute towards the hand’s value. So a hand that’s a nine, a five and an eight is worth two, not twenty-two. The dealer plays the player’s hand first after both player and banker have been dealt two cards. The player receives a third card if his first two are worth less than six. The banker has some complex rules to follow to ascertain whether he receives a third card. When both hands are complete, you are paid if you chose the winning hand. 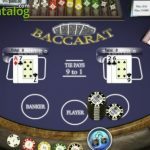 Rival’s version of baccarat has a number of configurable options. You can play fullscreen, and you can change the volume of the background sounds or turn them off completely. There are also two speed settings, ‘slow’ and ‘medium’. In our opinion these should have been more suitably labelled ‘painstakingly slow’ and ‘just a little bit too fast’. 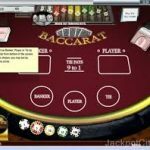 Another annoyance is that you cannot remove chips from the virtual baccarat table by clicking on them – you have to hit the minus key on your keyboard instead. The best thing that can be said about this game is that it plays baccarat. 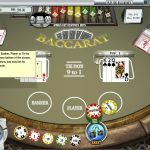 We have found better versions of RNG baccarat elsewhere, and we have found a few worse. The fact you have to use the minus key to remove chips is a real pain, we think. Why not use the right mouse button, or at least provide a clickable option? Not the greatest version of RNG baccarat ever produced, then.